hadn't had one of those for a while.. I think contacting support will be appropriate ..
For some reason i don't get those errors on my Mac. see...one of the reasons I will probably never get an mac ..
is because of that mac user elitist attitude..
it seems like a disease.. probably spraying them laptops with cocaine..
do you think my track will be lost? actually liked the ideas i had in this project! Difficult to say. Are you running the latest version? If not download that and see if it works. Otherwise as tech support. Assuming you're using a variety of 3rd party plugins in your project, I would try moving them so that they don't load. yep... 3rd party are the first culprits..
if it continues to happen..
try dragging in 1 track at a time from the live-browser..
CareyLetendre wrote: For some reason i don't get those errors on my Mac. ...on demand, whenever I like. See my other threads about inserting tracks/scenes/instruments in currently playing songs with complicated time signature changes in session view. So far the only real answer I got from tech support is "so it does!". Guess what the first thing I try on Live 9 will be? 3dot... wrote: see...one of the reasons I will probably never get an mac .. is because of that mac user elitist attitude.. Still, if the coke didn't make me feel smug enough, I imagine doing it of this nice brushed aluminium palm rest would make all the difference! CareyLetendre wrote: ...on demand, whenever I like. See my other threads about inserting tracks/scenes/instruments in currently playing songs with complicated time signature changes in session view. So far the only real answer I got from tech support is "so it does!". 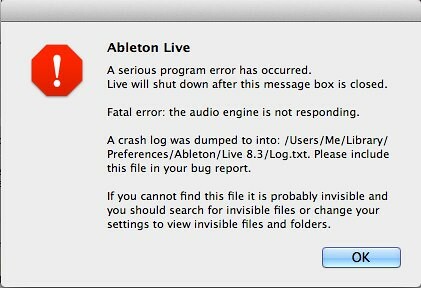 Guess what the first thing I try on Live 9 will be?